We are now only selling the ‘U-type’ headstages with the threaded white PTFE inert collets, which connect only to HL-U holders, or U-type adapters and model cells. All adapters and holders must be ordered separately. The HS-2 and HS-2A headstages are used with the Axoclamp and the GeneClamp. They are all unity-gain voltage recording headstages but they come in a variety of different current-passing gains for applications as diverse as extracellular recording, bath-potential recording, ion-sensitive recording, ionophoresis and intracellular recording from small or large cells. For ultra-high impedance electrodes, special circuitry inside the headstage prevents any DC current from leaking into the input through the capacitance neutralization circuit. “M” versions have extended capacitance neutralization range. “G” versions have grounded cases. 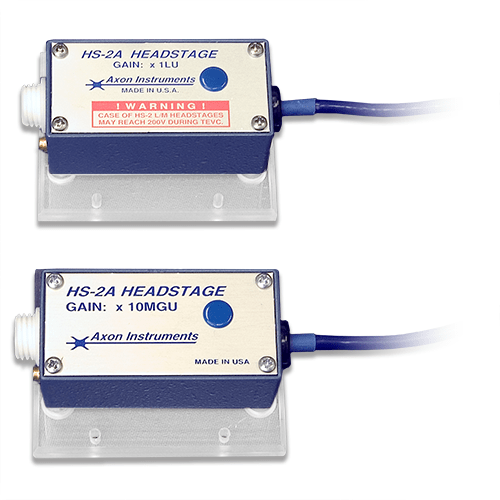 HS-2″A” series headstages have an extended operating voltage range (±150V). HS-4 headstages may be used with the Axoclamp to maximize the voltage across the electrode during two-electrode voltage clamp. In all other modes the HS-4 acts like an HS-2 headstage. Available only with current-passing gain x1MG. The VG-2 headstage must be used for current measurement. 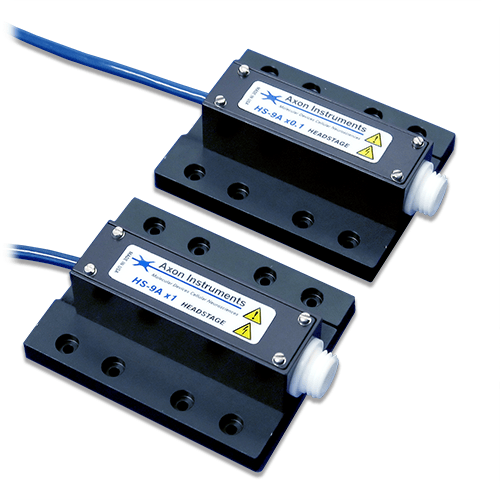 The VG-2 virtual ground headstage may be optionally used with the Axoclamp to measure whole-bath current. Standard current-measurement gains are x0.1, x1 and x10. x100 is also available. Current recording ranges for these virtual ground headstages are: ±0.1 µA (x0.1), ±1 µA (x1), ±10 µA (x10), ±100 µA (x100). The VG-2A-x100 bath-clamp headstage may optionally be used with the Axoclamp or the GeneClamp to clamp the bath potential at zero volts. This eliminates the effect of series resistance in the bath grounding electrode and the bath solution. It can also minimize the extent of DC voltage shifts resulting from changes in the bath solution or temperature. CV-5 headstages operate with the GeneClamp 500. Each headstage has one feedback resistor for current-to-voltage conversion. The transfer resistance of the 100G, 1G and 100M versions are 100 GΩ, 1 GΩ and 100 MΩ, respectively. The “B” version has an extended capacitance compensation range suitable for bilayers. 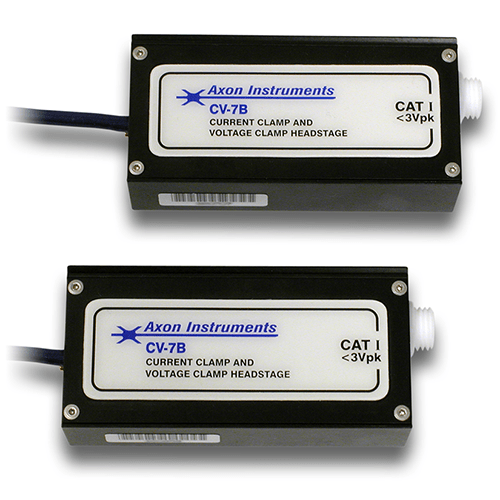 The 100G version is ideal for single-channel recording and vesicular-release amperometry. The 1G version is suitable for macropatch applications. The 100M version is used for fast cyclic voltammetry using carbon-fiber microelectrodes. The EX-1 extension cable works with HS-2, HS-2A, HS-4, VG-2 and VG-2A headstages. A 4″ (102 mm) long removable insulated mounting rod is provided at no charge with most headstages. Diameter is 5/16″ (7.9 mm) unless 1/4″ or 3/8″ (6.3 or 9.5 mm) is specified by purchaser. Additionally, all headstages include an insulated mounting plate. Many manufacturers of micromanipulators provide custom mounting brackets for Axon headstages. Four different sizes of cone washers allow the holder to accommodate pipettes with outer diameters from 1.0 to 1.7 mm. Suction port connects to 1 mm ID tubing. Low-noise easy-maintenance construction. Contains a 0.25 mm silver wire. Spare components supplied are as follows: cone washers (five of each size), four 50 mm lengths of silver wire and 70 mm of silicone tubing to make new seals. BNC adapter accepts a BNC-type electrode holder. 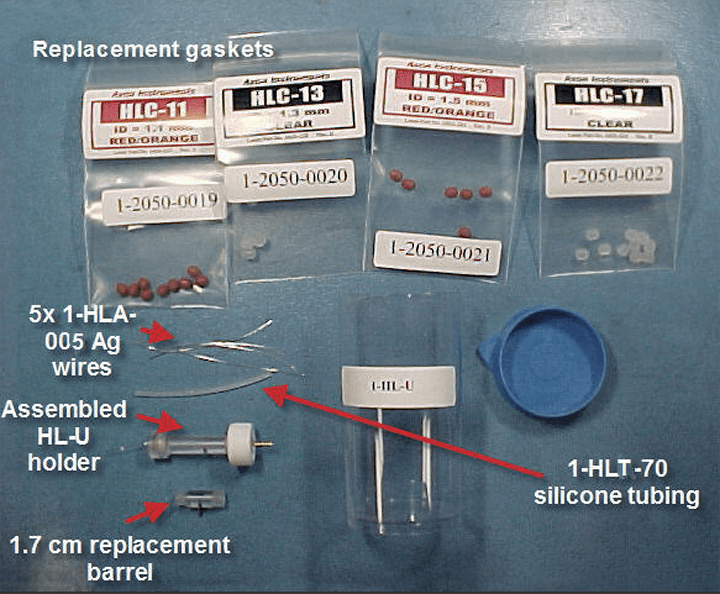 HL-1 series holders, the HLB-1 BNC adapter, and HLR-1 right-angle adapter fit the CV headstages previously used with the Axopatch and GeneClamp. Suction port connects to 1 mm ID tubing. Contains a 0.25 mm silver wire. Supplied with 5 spare ‘O’ rings, spare wire and a spare pierced rubber seal. HL-2 series holders, the HLB-2 BNC adapter, and HLR-2 right-angle adapter fit the HS-2, HS-2A, HS-4, VG-2, VG-2A and BH-1 headstages, or any headstage with a 2 mm jack. Suction port connects to 1 mm ID tubing. Contains a 0.25 mm silver wire. Supplied with 5 spare ‘O’ rings, spare wire and a spare pierced rubber seal. 1 mm diameter AgCl pellet on the end of an Ag wire. The Ag wire is insulated from the electrode solution by a wax-sealed PTFE inert tube. Ag wires used in all holders. The 0.25 mm wires are 50 mm long.